An oropharyngeal airway (also known as an oral airway, OPA or Guedel pattern airway - was designed by Arthur Guedel) is a medical device called an airway adjunct used to maintain a patent (open) airway. It does this by preventing the tongue from covering the epiglottis, which could prevent the person from breathing. When a person becomes unconscious, the muscles in their jaw relax and allow the tongue to obstruct the airway. Oropharyngeal airways come in a variety of sizes, from infant to adult, and are used commonly in pre-hospital emergency care and for short term airway management post anaesthetic or when manual methods are inadequate to maintain an open airway. This piece of equipment is utilized by certified first responders, emergency medical technicians, and paramedics plus other health professionals when tracheal intubation is either not available, not advisable or the problem is of short term duration. Oropharyngeal airways are indicated only in unconscious people, because of the likelihood that the device would stimulate a gag reflex in conscious or semi-conscious persons. This could result in vomit and potentially lead to an obstructed airway. 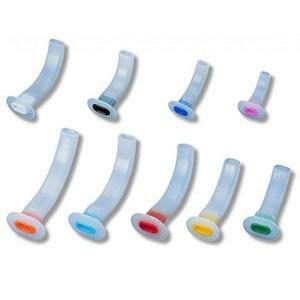 Nasopharyngeal airways are mostly used instead as they do not stimulate a gag reflex. In general oropharyngeal airways need to be sized and inserted correctly to maximise effectiveness and minimise possible complications - such as oral trauma. The correct size OPA is chosen by measuring from the corner of the person's mouth to the angle of the jaw. The airway is then inserted into the person's mouth upside down. Once contact is made with the back of the throat, the airway is rotated 180 degrees, allowing for easy insertion, and assuring that the tongue is secured. An alternative method for insertion, the method that is recommended for OPA use in children and infants, involves holding the tongue forward with a tongue depressor and inserting the airway right side up.